Stock buybacks are the preferred form of financial engineering in corporate America, through which companies borrow like crazy and give the money to their shareholders, artificially increasing their earnings-per-share ratio, massively reducing real economic growth, while enriching a tiny number of already-wealthy investors: but buybacks may finally be coming to an end. Buybacks have accounted for $3 trillion over the past 5 years, but in Q2 2016, buybacks fell for the first time since the buyback boom started; the next quarter, buybacks fell off 28% year on year, the first major setback in half a decade. Apple leads the pack in buybacks, and leads the practice of borrowing money to effect this spending. Apple has avoided taxes by claiming that it literally has no tax jurisdiction, a unique and uniquely outrageous claim that has got it into legal hot water -- so it has to borrow money against the funds it can't bring into the USA without paying its fair share of taxes. This strategy appears to have paid off, because now Donald Trump is promising to give Apple and other tax avoiders a massive tax break to bring their money back to the US -- a break that American businesses that followed the law will not get. 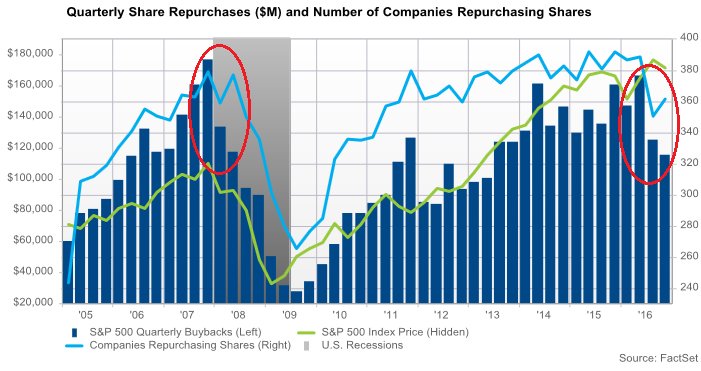 Buybacks have driven the stock-market bubble for five years. As they slow down, it's not clear what will happen next -- maybe Trump will undo the Dodd-Frank Act and allow banks to go on another money-printing/bad-debt spree like the one that caused the 2008 crisis, producing a short term bubble to replace buybacks. This is a nasty wrinkle in the buyback scenario. But there’s hope. Trump has pledged to change the corporate tax code, and/or give corporations a tax holiday on this “overseas” cash so that they can “repatriate” it, by selling their US Treasurys and other investments and using the proceeds to buy back their own shares. That’s what happened last time the government granted this kind of tax holiday in 2004. And everyone is hoping that it will happen again. I suspect that’s one of the reasons for the surge in stock prices since the election. If not, and if this major stock-buying force continues to wheeze like this, our eternally wondrous stock market might be in serious trouble.